I am neither a neuroscientist nor a very accomplished musician, but I'd like to talk about the intersection of neuroscience and music. I have a theory that there is a neuroscience basis for why it takes a mature musical palate to enjoy jazz. First, let me say a little something about neuroscience (based on the limited understanding I've gained by watching a bunch of talks). One of the things your brain is particularly good at is recognizing patterns and predicting patterns. At the lowest level, if two nerves are close to each other, and they both fire, it's counted as a pattern--i.e. those two things are connected. Similarly, if a nerve fires and then a short while later it fires again, that's a pattern as well. Hence, if both of my fingers feel something, there's a pattern, or if I feel a tapping on a single finger, that's a pattern as well. However, the brain is not limited to low level patterns. Rather, it can respond to a hierarchy of patterns. Paraphrasing Pavlov, if a dog hears a can opener and then smells food and then gets fed, we all know that the dog will soon recognize the pattern and start salivating as soon as he merely hears the can opener. My point is that a sophisticated pattern is composed of lower level patterns recursively, all the way down to the level of individual neurons firing. Next, let me talk about sine waves and chords. Let's start with a single note. A single note might look something like y = sin(x): This wave is very simple, and somewhat boring. Now, let's look at a chord consisting of a single note as well as the note that is an octave above it. Here's y = sin(x) + sin(2 * x): This curve is somewhat more sophisticated. However, you can still recognize the pattern by the time x = 10. Now, let's look at what I think is a fifth, which is still a nice sounding chord. Here's y = sin(x) + sin(1.5 * x): This pattern is slightly more sophisticated, but it's still pleasingly recognizable. Now, let me show you something that is not pleasing to the ear. This curve represents what might happen if you hit two keys that are right next to each other on the keyboard. Here's y = sin(x) + sin(1.1 * x): This curve pulses in an ugly way. You have to get all the way out to x = 120 or so to even see the pattern. In a manner of speaking, the pattern is only there by "brute force". So what's my point? Simple patterns are easy to recognize, and they can be recognized in less time (i.e. for smaller variations of x, which I probably should have called t). Here's something that I think is more of a jazz chord. Here's y = sin(x) + sin(1.25 * x) + sin(1.5 * x) + sin(2 * x): This curve is really interesting. You can recognize what's going on by the time you get to x = 50, but the "texture" of the curve is a lot more interesting. Whenever I play this sort of chord, it sounds deep, rich, and interesting. If the first chord reminds me of "Mary had a Little Lamb", this last chord reminds me of the forbidden love between Lancelot and Guinevere and the pain it caused King Aurthur. So what's my point? You have to go higher up the pattern recognition pyramid in order to recognize more sophisticated patterns. A more sophisticated musical palate is able to recognize patterns that a simpler musical palate may not recognize. That's why jazz requires a sophisticated palate--it uses chords that require more effort to recognize. Of course, there are many dimensions to music, and individual chords are just one dimension. There are also chord progressions and beats. The same sort of thing applies to these other dimensions. 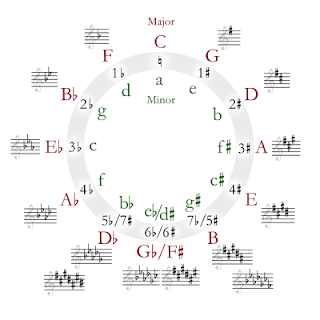 Here's the circle of fifths (thanks Wikipedia! ): Pick any three chords in a row on the circle of fiths, such as C, G, and D, and you have the basis for a simple, feel-good song. If you just bounce around between the different chords on a guitar using different strumming patterns, you'll immediately recognize a song you already know or create a new song that sounds pleasing. Throw in a few 7th chords and a few minor chords, and the song starts taking on additional richness because the pattern becomes less simple. 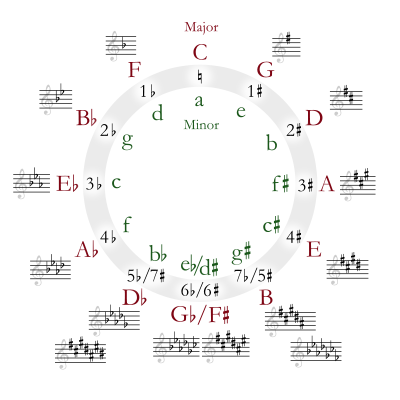 If you try to use more than three chords from the circle of fifths, your brain might be left thinking, "Wait a minute. What key am I supposed to be in?" It may be more difficult to recognize the pattern. However, this is exactly the sort of thing that happens in jazz. The same thing applies to beats. Here's a simple walz, "Um pa pa. Um pa pa." Here's a typical rap beat, "Bum chbum bum chbumbum ch bum bum ch." More sophisticated beats require more sophisticated pattern recognition. Every song is composed of some pattern repetition and some pattern violation. Simple, pop songs that are enjoyable by youthful palates involve a lot of pattern repetition and less pattern violation. Sophisticated music palates enjoy songs with less pattern repetition and more pattern variation. Furthermore sophisticated music palates get bored of songs more quickly. They recognize the patterns quickly, and they're ready to move on. Furthermore, popular songs are played more often on the radio so that your brain has a better chance to become more familiar with the patterns. A listener will usually enjoy the song more after listening to it 10 times than if he's only listened to it once. If a song has so much pattern repetition that you enjoy it the first time, you'll often grow bored of it very quickly. Conversely, it's very difficult to enjoy sophisticated classical pieces the first time you hear them. All the popular classical pieces have been driven into our heads since we were kids. Why is this? I think this can be explained by neuroscience as well. The brain works hard to find patterns, and when it does, the simple recognition of a pattern is somewhat calming. It's says something like, "Hmm, I've seen that pattern before. Coooooool." However, if a pattern is repeated too often, the brain starts to filter it out; it becomes boring. It says, "Nothing new here. Pay attention to something else." Pattern violations catch your attention. You brain says, "Hey, wait a second. I didn't expect that! You should pay attention because something new is happening!" Hence, composers must always straddle the line between calming pattern repetitions and exciting pattern violations. How far you go in either direction dictates how sophisticated a musical palate will be required to enjoy the song, and thus, who will enjoy it. Ok, so that's my theory of neuroscience and music. I don't have any MRIs to back it up, nor do I have the educational background to claim real expertise on the subject. Nonetheless, I think there's some truth to it. I don't claim to have a very well developed ear, but listening to Grisey's Partiels was certainly interesting. You might enjoy an episode of "Ingenious Minds" on the Science Channel. A guy suffers head trauma and turns into an 'acquired savant' - he becomes obsessed with music and turns into a musical prodigy.